When Sekou Toure of Guinea decided in 1958 to get out of french colonial empire, and opted for the country independence, the french colonial elite in Paris got so furious, and in a historic act of fury the french administration in Guinea destroyed everything in the country which represented what they called the benefits from french colonization. Slowly fear spread trough the african elite, and none after the Guinea events ever found the courage to follow the example of Sekou Toure, whose slogan was We prefer freedom in poverty to opulence in slavery. He didn't want his country to continue to be a french dominion, therefore he refused to sign the colonisation continuation pact De Gaulle proposed, but agree to pay an annual debt to France for the so called benefits Togo got from french colonization. It was the only conditions for the French not to destroy the country before leaving. However, the amount estimated by France was so big that the reimbursement of the so called 'colonial debt' was close to 40% of the country budget in 1963. On January 13, 1963, three days after he started printing his country own currency, a squad'of illiterate soldiers backed by France killed the first elected president of newly independent Africa.Olympio was killed by an ex French Foreign Legionnaire army sergeant called Etienne Gnassingbe who supposedly received a bounty of $612 from the local French embassy for the hit man job. Olympio's dream was to build an independent and self-sufficient and self-reliant country. But the French didn't like the idea. On November 19, 1968, like, Olympio, Keita will be the victim of a coup carried out by another ex French Foreign legionnaire, the Lieutenant Moussa Traore. On January 1st, 1966, Jean-Bedel Bokassa, an ex french foreign legionnaire, carried a coup against David Dacko, the first President of the Central African Republic. On January 3, 1966, Maurice Yameogo, the first President of the Republic of Upper Volta, now called Burkina Faso, was victim of a coup carried by Aboubacar Sangoule Lamizana, an ex French legionnaire who fought with french troops in Indonesia and Algeria against these countries independence. On 26 October 1972, Mathieu Kerekou who was a security guard to President Hubert Maga, the first President of the Republic of Benin, carried a coup against the president, after he attended French military schools from 1968 to 1970. "Without Africa, France will slide down into the rank of a third [world] power"
"Without Africa, France will have no history in the 21st century"
At this very moment I'm writing this article, 14 african countries'are obliged by France, trough a colonial pact, to put 85% of their foreign reserve into France central bank under French minister of Finance control. Until now, 2014, Togo and about 13 other african countries still have to pay colonial debt to France. African leaders who refuse are killed or victim of coup. Those who obey are supported and rewarded by France with lavish lifestyle while their people endure extreme poverty, and desperation. It's such an evil system even denounced by the European Union, but France is not ready to move from that colonial system which puts about 500 billions dollars from Africa to its treasury year in year out. We often accuse African leaders of corruption and serving western nations interests instead, but there is a clear explanation for that behavior. They behave so because they are afraid the be killed or victim of a coup. They want a powerful nation to back them in case of aggression or trouble. But, contrary to a friendly nation protection, the western protection is often offered in exchange of these leaders renouncing to serve their own people or nations' interests. From then on France accepted only�an �independence on paper� for his colonies, but signed binding �Cooperation Accords�, detailing the nature of their relations with France, in particular ties to France colonial currency (the Franc), France educational system, military and commercial preferences. The newly �independent� countries �should pay for the infrastructure built by France in the country during colonization. The African countries should deposit their�national monetary reserves�into France Central bank. �The monetary policy governing such a diverse aggregation of countries is uncomplicated because it is, in fact, operated by the French Treasury, without reference to the central fiscal authorities of any of the WAEMU or the CEMAC. Under the terms of the agreement which set up these banks and the CFA the Central Bank of each African country is obliged to keep at least 65% of its foreign exchange reserves in an �operations account� held at the French Treasury, as well as another 20% to cover financial liabilities. The CFA central banks also impose a cap on credit extended to each member country equivalent to 20% of that country�s public revenue in the preceding year. Even though the BEAC and the BCEAO have an overdraft facility with the French Treasury, the drawdowns on those overdraft facilities are subject to the consent of the French Treasury. The final say is that of the French Treasury which has invested the foreign reserves of the African countries in its own name on the Paris Bourse. In short, more than 80% of the foreign reserves of these African countries are deposited in the �operations accounts� controlled by the French Treasury. The two CFA banks are African in name, but have no monetary policies of their own. The countries themselves do not know, nor are they told, how much of the pool of foreign reserves held by the French Treasury belongs to them as a group or individually. 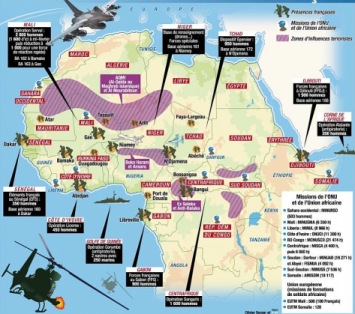 It�s now estimated that France is holding close to 500 billions African countries money in its treasury, and would do anything to fight anyone who want to shed a light on this dark side of the old empire. The African countries don�t have access to that money. France has the first right to buy any natural resources found in the land of its ex-colonies. It�s only after France would say, �I�m not interested�, that the African countries are allowed to seek other partners. In the award of government contracts, French companies must be considered first, and only after that these countries �could look elsewhere. It doesn�t matter if the african countries can obtain better value for money elsewhere. As consequence, in many of the french ex-colonies, all the majors economical assets of the countries are in the hand of french expatriates. In C�te d�Ivoire, for example, french companies own and control all the major utilities � water, electricity, telephone, transport, ports and major banks. The same in commerce, construction, and agriculture. In the end, as I�ve written in a previous article, Africans now Live On A Continent Owned by Europeans! Through a sophisticated scheme of scholarships, grants, and �Defense Agreements� attached to the Colonial Pact, the africans should send their senior military officers for training in France or French ran-training facilities. The situation on the continent now is that�France has trained hundreds, even thousands of traitors and nourish them. They are dormant when they are not needed, and activated when needed for a coup or any other purpose! When President Laurent Gbagbo of C�te d�Ivoire tried to end the French exploitation of the country, France organized a coup. During the long process to oust Gbagbo, France�tanks, helicopter gunships and Special Forces intervened directly in the conflit, fired on civilians and killed many. After France succeeded the coup, and transferred power to Alassane Outtara, France requested Ouattara government to pay compensation to French business community for the�losses during the civil war. Oui, Monsieur. Vous devez parlez fran�ais, la langue de Moli�re! A French language and culture dissemination organization has been created called �Francophonie� with several satellites and affiliates organizations supervised by the French Minister of Foreign Affairs. As demonstrated in this article, if French is the only language you speak, you�d have access to less than 4% of humanity knowledge and ideas. That�s very limiting. That�s the real milk cow for France, but it�s�such�an evil system even denounced by the European Union, but France is not ready to move from that colonial system which puts about 500 billions dollars from Africa to its treasury. During the introduction of Euro currency in Europe, other european countries discovered the french exploitation �scheme. Many, specially the nordic countries, were appalled and suggested France get rid of the system, but unsuccessfully. #9. �Obligation to send France annual balance and reserve report. African countries in general are the ones with will less regional military alliances. Most of the countries have only military alliances with their ex-colonisers! (funny, but you can�t do better!). Their contribution is often ignored or minimized, but when you think that it took only 6 weeks for Germany to defeat France in 1940,�France knows that Africans could be useful for fighting for la �Grandeur de la France� in the future. First, �France is severely addicted to looting and exploitation of Africa �since the time of slavery. Then there is this complete lack of creativity and imagination of french elite to think beyond the past and tradition. Finally, France has 2 institutions which are completely frozen into the past, inhabited by paranoid and psychopath �haut fonctionnaires� who spread fear of apocalypse if France would change, and whose ideological reference still comes from the 19th century romanticism: they are the Minister of Finance and Budget of France and the Minister of Foreign affairs of France. It�s up to us as African to free ourselves, without asking for permission, because I still can�t understand for example how 450 french soldiers in C�te d�Ivoire could control a population of 20 millions people! ?